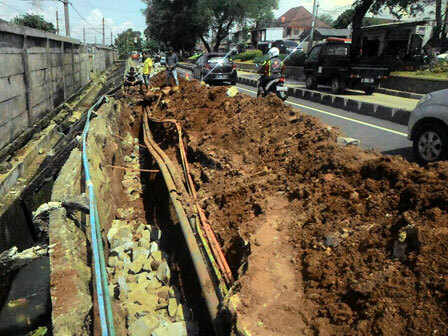 Jalan I Gusti Ngurah Rai that collapsed in Klender, Duren Sawit, East Jakarta began repaired.
" The problem is heavy rain. It surely causes traffic jam and we must carefully repair the road"
Based on Beritajakarta.com observations, Tuesday (10/25), around 11 workers are seen digging a collapsed road as long as 20 meters with 1.5 meters deep. Muamalah (34), one of workers admitted, reparation has been ongoing since Saturday (10/22). "Heavy rain is our main problem. Thus, the soil that has been dug up becomes thick back and we had to dig up to look for land denseness," he stated, Tuesday (10/25). Head of East Jakarta Bina Marga Sub-dept, Juani Yusuf explains, road reparation is predicted to require Rp 20 million and will finish two weeks ahead. "The problem is heavy rain. It surely causes traffic jam and we must carefully repair the road," he said.